Australian artist and personality Danila Vassilieff (1897-1958) is the subject of the compelling documentary The wolf in Australian art , produced and directed by Richard Moore based on the book by Felicity St John-Moore. 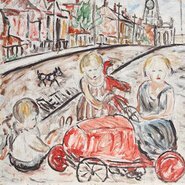 During the 1940s when individualism was ‘in the air’, Vassilieff liberated a group of younger painters – Sidney Nolan, Arthur Boyd, Albert Tucker, Joy Hester and John Perceval – to paint their own original visions. This film establishes the link between Vassilieff and Nolan and shows how Vassilieff’s art led directly to Nolan’s Kelly series, including First-class marksman in the Gallery’s collection.